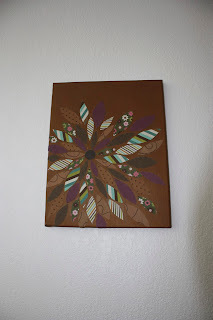 I had seen a few of these floating around on Pinterest, and I have been trying to get back into painting lately, so I thought some free and easy wall art would be perfect for my broke barren walled new home. I already have oil paints, which I prefer to paint with. You'll also need some scrapbooking pages, you can buy individually at craft stores or a pad of various ones of the same color palette. Over the years, I'm sure most of us have accumulated a stash of various types of decorative papers, such as the scrap-booking papers I seem to have thousands of.... 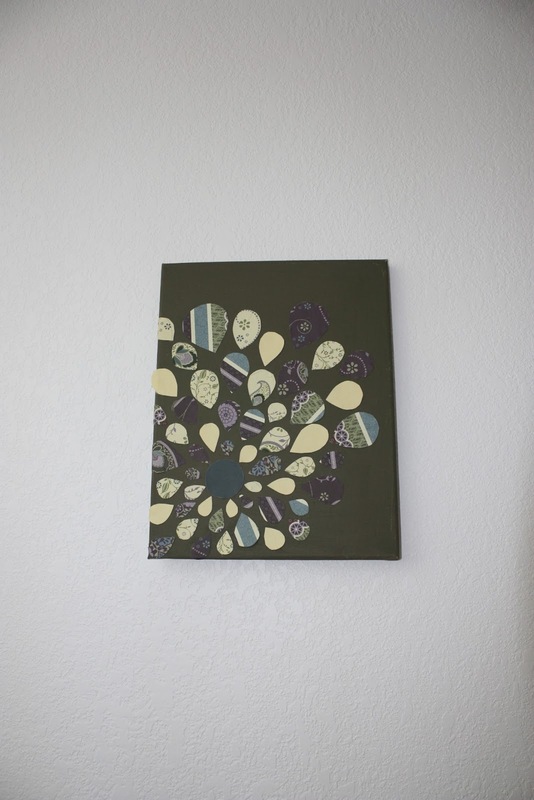 Pick 5-6 sheets of complementary designs and colors for each canvas. I decided to go with a gold hinting in my background paints of green, orange and purple so I selected complimentary colors for each of those. Next I cut the center of my flowers and determined there location, but by only placing them atop the canvas, not affixing them yet. I made a series of "leaves" for each canvas, but each canvas having its own distint shaped leaves. For the Gold my leaves are very traditional angular shape, for the Green canvas I used a bulbous round leaf, and for the Purple canvas I went with a more heart shaped leaf. You'll want to do each canvas individually so you don't get any mixed up. Start with small leaves, and then gradually increase your leaf sizes out, laying them on the canvas, radiating from the center piece. When you have made them in a design that you like, you can stop, and be finished cutting. Then comes the glue gun... Start gluing down the pieces one at a time, pressing down as much as you can, so that it lays flat on the canvas. Once that has dried you can paint over the entire canvas with mod podge if you desire, I have matte mod podge, so thats what I did.